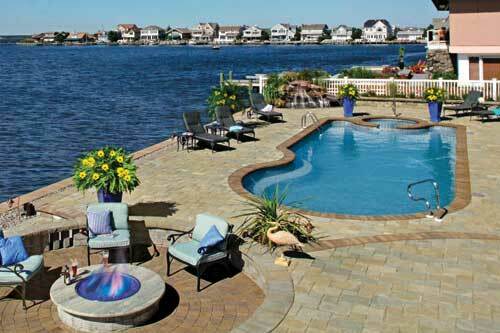 The Cambridge Pavers with ArmorTec Renaissance Collection is defined by a naturally aged surface, which can be smooth or textured. Cambridge designers developed the “aged” shapes and design kits of this collection with the walkways, piazzas and roadways of the European Renaissance in mind. The shapes and color choices available in this collection give the appearance of naturally aged stone, which will complement any historic, vintage or contemporary landscape. Included in the Renaissance Collection are the 4 x 8 Holland stone, 6 x 6, 6 x 9, 12 x 12 and 6 x 12 Bullnose 2-3/8 thick. The Circle Design Kit is available in ruby/onyx, sahara/chestnut and sandstone, among others. There are four color choices for the Random Design Kit: onyx/natural, sahara/chestnut, toffee/onyx and New England blend. The Renaissance V Design Kit includes 11.8 x 11.8, 5.9 x 11.8, 5.9 x 8.85, 5.9 x 5.9, and 3 x 5.9 stones. There is also an Olde English 3-piece Design Kit available per pallet – it has 80 large pieces, 70 medium pieces and 80 small pieces and is available in 8 color choices. The Ledgestone 3-Piece Design Kit is a combination of three extra-large, square and rectangular, modular shapes, defined by prominent clefts on their surfaces, similar to that of a bluestone. This series also offers a Ledgestone Circle Design Kit, available in seven colors; it features seven special shapes to form a 10.33’ circle, at 110 square feet per cube. There is also an 18 x 18 modular component that is packaged separately from the other three combined shapes in Ledgestone 3-piece Design Kit. Both Design Kits, as well as the 18 x 18 modular component, are available in the Sherwood Collection. However, the Ledgestone Renaissance differs in that it features the aged appearance for which the Renaissance Collection is known. The Ledgestone 3 Pc. Design Kit is a combination of three extra-large, square and rectangular, modular shapes with prominent, bluestone-like clefts on their surfaces. The 18 x 18 modular component is packaged separately from the other three combined shapes in Ledgestone 3 Pc. Design Kit. Both Design Kits and the 18 x 18 shape are also available in Ledgestone Renaissance for an aged appearance.